The Nordic/Scandanavian Junior’s Abroad experience will combine exploration of natural wonders such as deep green fjords and lagoons, boreal forests and glaciers, and volcanic parks, with Viking history, contemporary Nordic design, and medieval architecture. This trip will be a three week investigation into metropolitan centers of Sweden and Norway as well as views of more rural communities of the Scandinavian Peninsula. We hope to start the trip in Iceland, exploring Reykjavik and the surrounding region. Themes of the trip will include art, design and architecture, local food culture, adventure/hiking day-tripping, and agri-tourism. 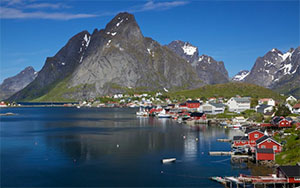 The trip destinations will base in Stockholm, Gothenberg, Oslo, Bergen and Reykjavik. On a scale of 1-5 activity level, with 5 being extremely strenuous, we would rate this trip as a 3. Participants must have the stamina to walk about 10 miles per day, including several day hikes over moderately rough terrain. Temperatures in Scandinavia at this time of year can range from 37-60 F.
If you love nature and you are looking forward to seeing some incredible scenery, but also long to spend at least some time in a contemporary European setting, this trip is for you!